Posted: Thursday 6th June 2013 in News, Owned and earned media, Retail Strategy, Thought Leadership. 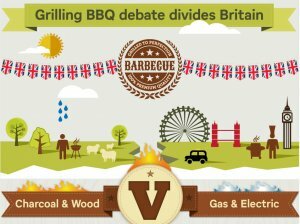 With Summer almost here and in the spirit of National BBQ Week, Summit’s SEO team have been working with a long-standing client, Homebase, to create a Grilling BBQ Debate infographic. Homebase, part of the Home Retail Group is a leading home enhancement retailer selling over 38,000 products for the home and garden. They are always on the lookout for new and exciting ways to engage with their customers. Summit identified the infographic ‘Grilling BBQ Debate Divides Britain’ as fun and creative way to promote the BBQ Season and engage with customers to find out the truth behind their BBQ habits. Creative content marketing is a central feature of Summit’s SEO proposition representing a natural and sustainable means of promotion. In this latest publication, we strive to end the age old debate of Gas Vs. Charcoal fuelled barbecues. Together with Homebase, Summit have compiled stats to suggest that 65% of the Nation prefer to BBQ with charcoal & wood compared to just 35% who grill with gas or electric. Other enlightening insights tell us that 80% of guys tangle with the BBQ tongs, compared to just 20% of girls who go for the grill. You may also be interested to know that that 8% of adults claim to have found love over the coals!